Wall crosses and crucifixes are on sale now. 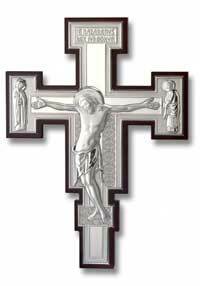 Whether you are looking for a wall cross or a table crucifix we have a selection of designs, materials, and prices you will like. Decorate your home or office with this ever lasting symbol of Christian faith. Shop and save today. You get Free Shipping with no minimum for US bound orders. Check our Crucifix Pendants or Cross Pendants. Or check our Religious Jewelry Catalog for a broad selection of Catholic and Christian jewelry. St Benedict Wood Crucifix 9123-5 12"